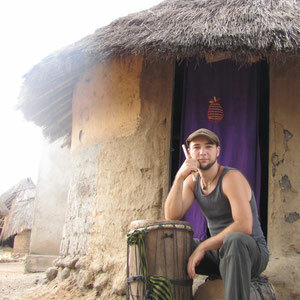 You want to learn how to play African drums? In this case you're just right here. At TAXI BROUSSE you learn traditional rhythms from the rich drumming culture of the Malinke People in Hamana (Guinea - West Africa). We are playing on the Dunduns (The three bassdrums Sangban, Dundunba & Kensedeni and of course on the Djembé. This music is made for playing together. Therefor it makes sense to learn it with others. At TAXI BROUSSE I teach mostly in groups. You learn the essence of the music, how the different patterns go together, how to communication in between the musicians work and how you make it groovy. Of course you learn the right technique on the different instruments. So you will be able to play them powerful, fluently and ergonomicly. Beside that you learn a lot about the origin of the rhythms, about the connection between dance and music and the festival culture of the Malinke people. You can experience how diverse and filled with live this music can be and how much communication is hiding within it. By the way... If you want it, one by one lesson would be possible as well.